Keep Fresh Vegetables, Salad bars, Sodas, Fruits, Meats and more Chilled with a Drop-in Cold Well. 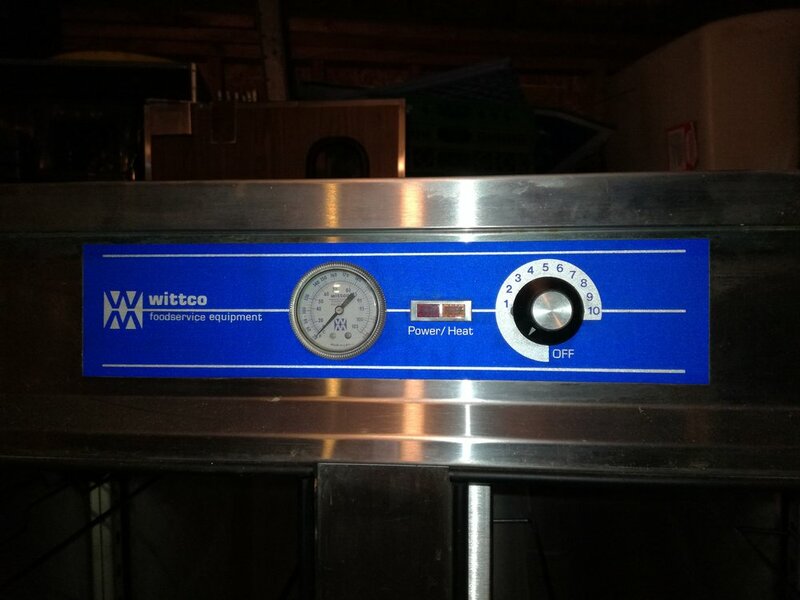 Available are 4 Stainless Steel Drop-In Refrigerated Cold Pan Units. Great clean appearance ! Build these directly into your concession trailer, food truck, restaurant or commissary. They get COLD and hold temp very well. These are great for a salad bar set up, catering concession trailer or truck, or drop them down in a table to have a mobile refrigerated Island. Two 4 pan capacity wells & Two 3 Pan units available. Also one cold plate shelf. These units do not require ice as they are electric. Delfield Brand made in USA 120V Single Phase 6 amp . Solid working units. 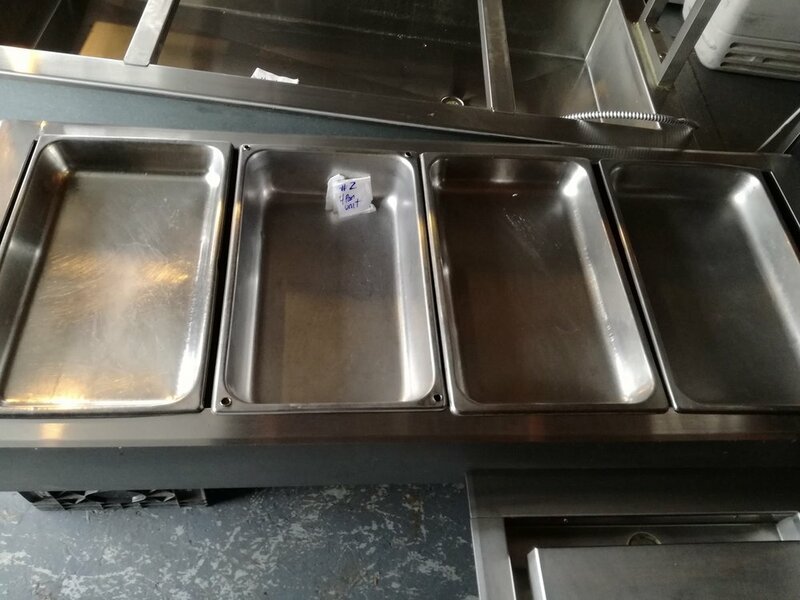 Various sizes of Stainless Steel pans & Inserts in excellent clean condition. Multiple quantities available. Let us know what you need. 1/2 size 2" pans & lids available. $10 each. Save costly napkins. One-at-a-time dispensing reduces usage and helps provide a more hygienic operation. Easily loadable and professional looking. Great for caterers and restaurant use age. Compatible with most napkins. Easy to use,clean and refill. 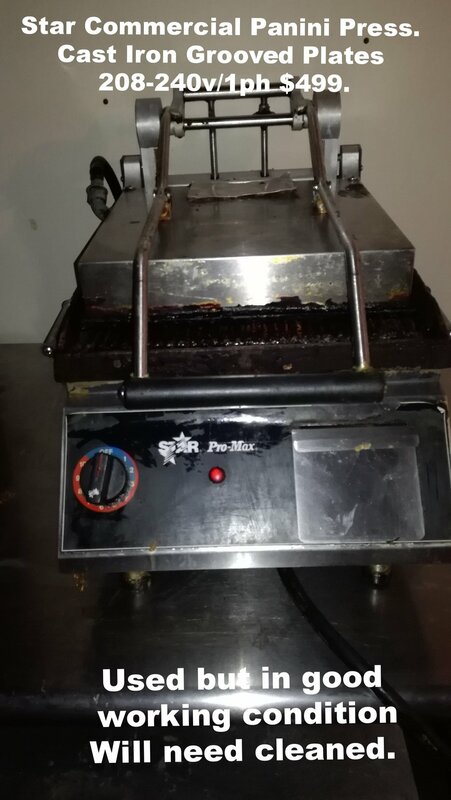 Perfect for restaurant, bar, catering operation. Customers love them. Save costly napkins. yourself the hassle of passing out napkins. Easily and quickly refill. Units are wall mountable and semi heavy to keep from blowing over. Two available. Excellent pot washing/soaking sink. This is a large SS unit made by Hobart. Motor condition is unknown, we have not tested it. 3 phase large motor. Make short work on cleaning pots, pans, car parts, electronics, clean whole hogs, deer meat, anything you want to clean. 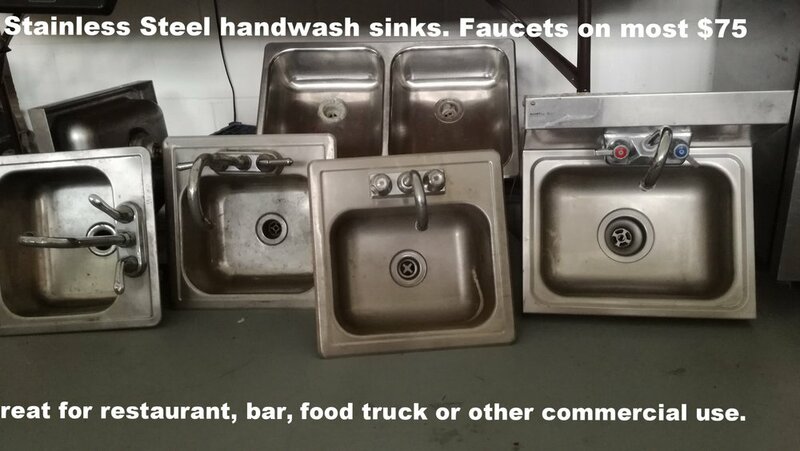 Comes with stainless steel faucet. Heavy duty sink!! Don't miss this. Measures 34 in deep by 5 ft 5 in wide. The bowl measures 28 in Deep by 42 in Long and it's depth is 18 in. Excellent shape countertop pizza oven. 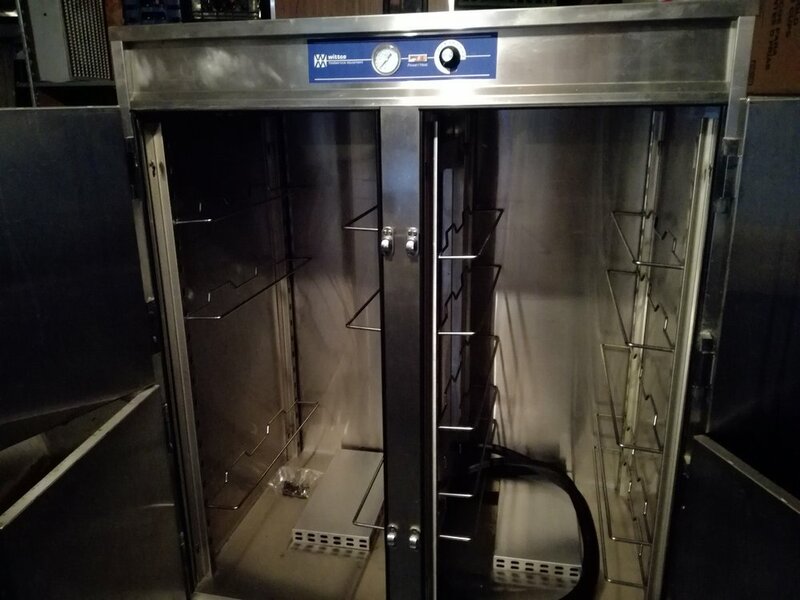 These ovens are designed to cook a variety of menu items such as fresh dough pizza, blanched pizza, subs, cookies, fish and more quickly and easily while conserving cooking space. * Quartz Infrared Heaters provide faster, more consistent heating than traditional heating elements. * Dual Elements are located above and below conveyor belt allowing precise even heating of products. * Forced convection increases productivity by circulating preheated air into the cooking chamber. 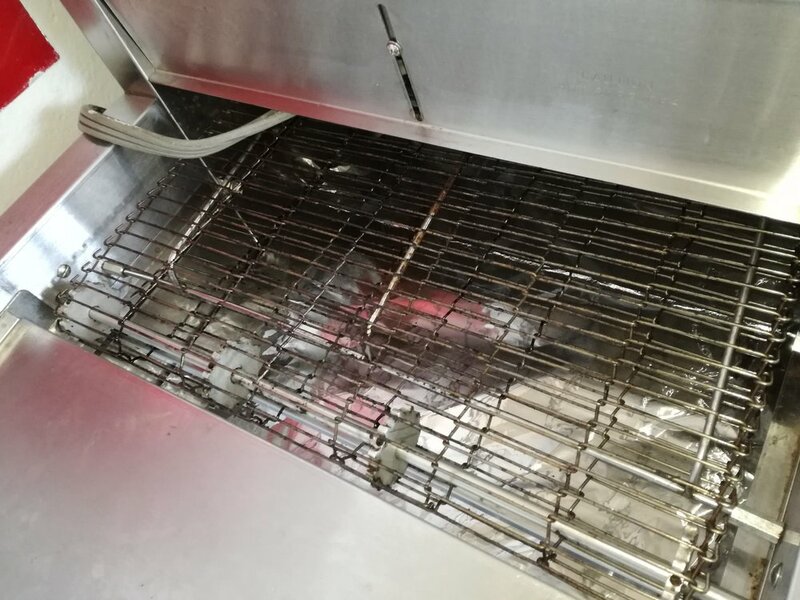 * Conveyor belt speed control and top and bottom heat control enables different menu items to be baked on the same oven providing superior flexibility. * Ovens can be stacked one, two or three high with our stacking spacer to conserve cooking space. *Production: 10-12 16" pizza's/hour, or 14-16 12" pizza's/hour, or 90-110 5" pizzas/hour. 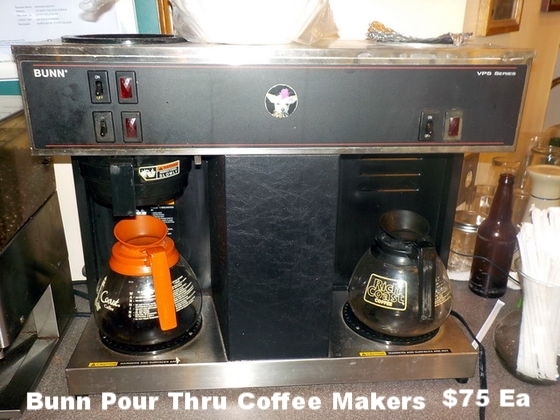 *Great for a sandwich shop, food courts, caterers, kiosks, supermarket, deli, restaurant. * If you have another unit, it can be stacked. 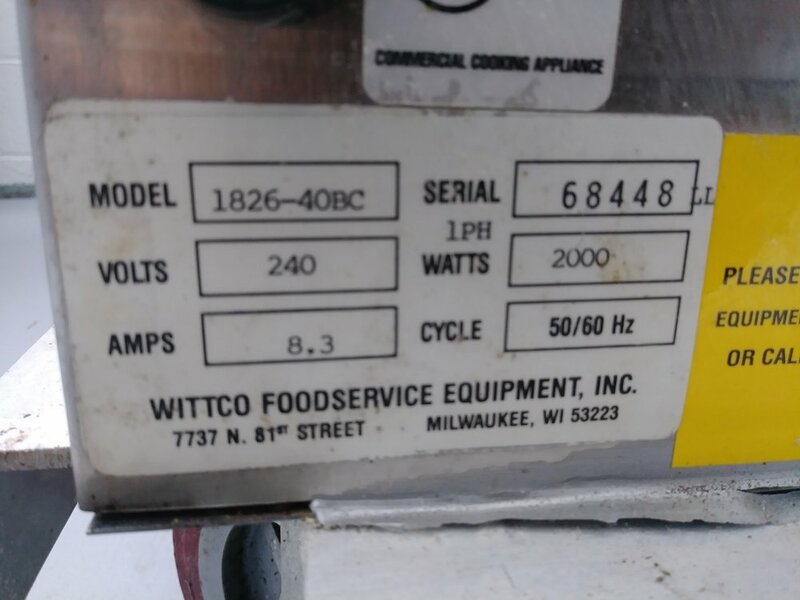 Brand new, never used Wittco food holding cabinet. This unit is new. It was never used. Well build stainless steel cabinet on heavy duty casters. Easy access with 4 individually opening doors. 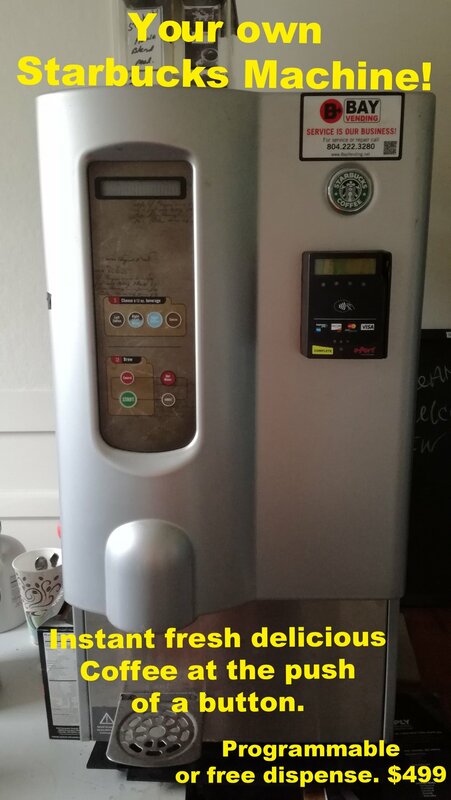 Unit can be adjusted up to 220F (105c) with the turn of a button. 8 racks are included, but more can be added. Unit will hold full size or half size pans or sheet trays. Will support 21 shelves per side. 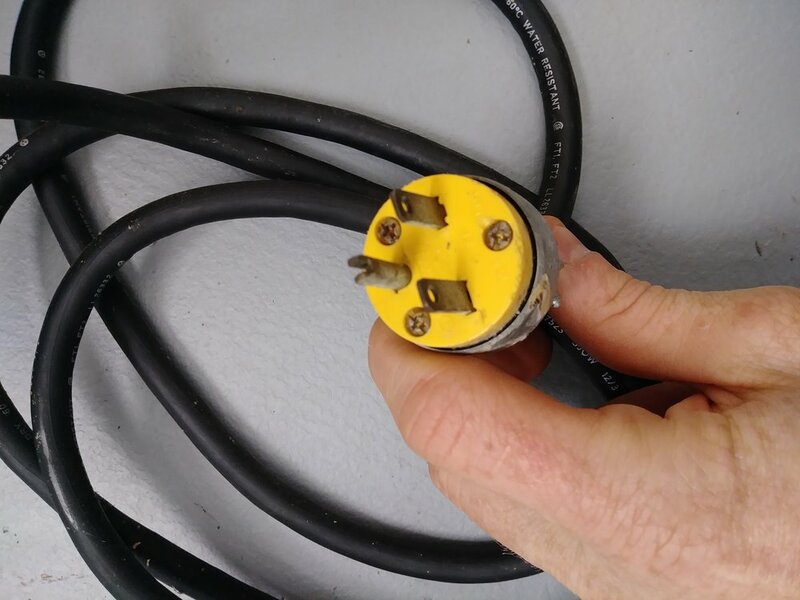 Unit is electric 220v with a 30 amp plug. Excellent shape, and has wheels for easy mobility. Great for a caterer or kitchen. Units weight and measurements available. 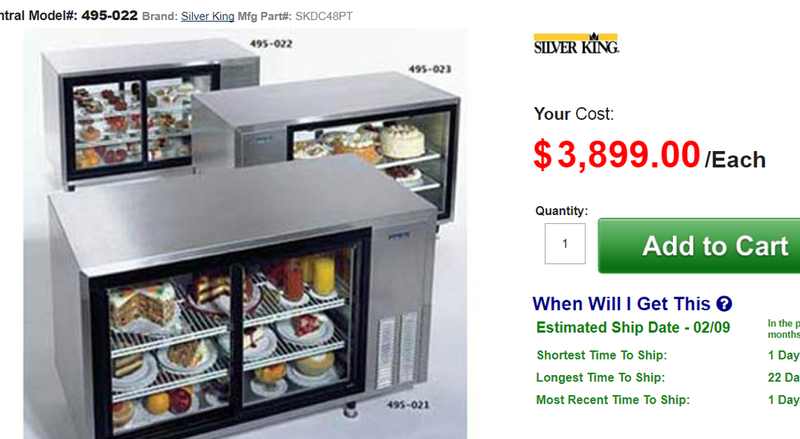 Like NEW Silver King Countertop Refrigerated Display Cases, Model SKDC48. Made from Stainless Steel on all sides. Energy efficent, uses just 3.9 amps to run. Dual Easy access from both sides. GREAT for counter top use for baked goods, pies, cakes, ready to eat foods. Can be used to display items for your customers. Also could work great as a prep fridge and put your cooking/holding equipment on top. Wide heavy duty stainless top makes a great work surface. 3 Available. * Exterior Dimensions - 31" high x 48" wide x 23" deep Roughly 2ft by 4 ft. Unit does not have legs. Dazzle your customers with this extraordinary stunning chandelier. 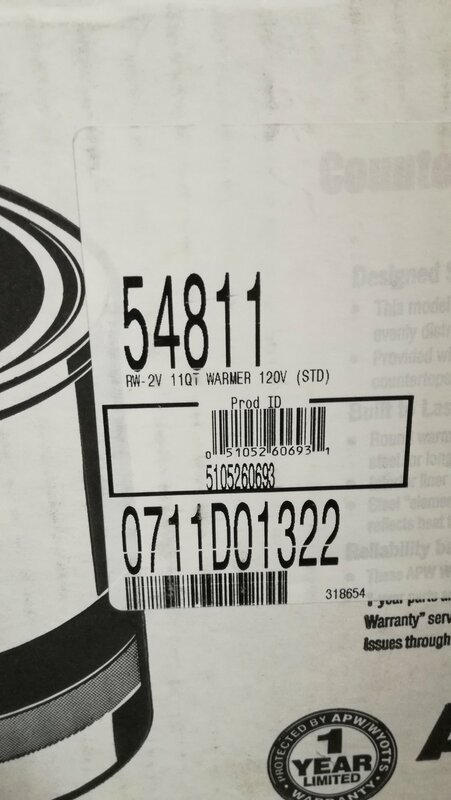 This was custom made in 2010 for over $14,672 but never used nor installed. It is in new condition still in a packing crate and has been re sealed. ( opened for pictures only) It was designed by an Artist from Los Angeles for the Holly Wood Casino but kept as an extra. 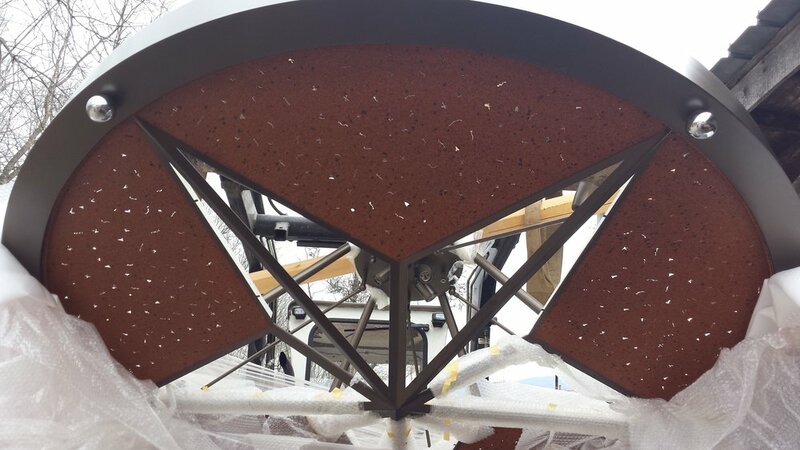 It measures 6' in diameter and 2 ft top to bottom. Glowing with over 10 candelabra, it will surely WOW your guests. This lovely piece would make an excellent show piece in your restaurant, hotel, resort, church or place of business. We are open to offers on this piece. Own a piece of history or add this to your personal home to truly increase its value. Interested parties are welcome to see in person.